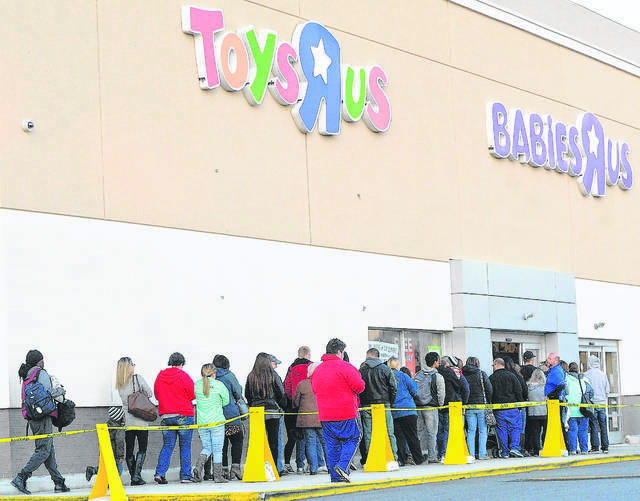 Customers line up outside Toys “R” Us in Lima last Thanksgiving to get holiday shopping deals. The store is set to close June 30. LIMA — The Toys “R” Us and Babies “R” Us in Lima will both close June 30, according to a Worker Adjustment Retraining Notification posted on the Ohio Department of Job and Family Services website. When the Lima location, 2292 Elida Road, officially closes, it will lay off 43 employees. Statewide, the company plans to lay off 1,178 people statewide as part of its national shutdown. Some stores closed as early as May, according to letter sent last month from Toys “R” Us Inc. human resources to the Ohio Department of Job and Family Services. Liquidation sales at some of the stores began as early as February. In April 2017, Toys “R” Us Inc. had $5 billion in debt. In September of 2017, the parent company voluntarily filed for bankruptcy protection under Chapter 11. Although the nation’s largest toy store retailer was approved by court approval to close approximately 180 stores across its Toys “R” Us and Babies “R” Us stores nationwide, the company decided to close all of its 740 U.S. locations instead.